Let’s go under the sea, where buried treasure floats in sunken treasure chests. Ocean Treasure takes us deep down to places no living creature, except for the occasional mermaid or merman has been, where we can find treasures beyond our wildest dreams and hit that jackpot before we come up for air. As a depth gauge appears and goes wild, letting us know just how far under the sea we are, we see a smiling shark gliding past and then our deep see diver, grin on his face and an antiquated diving suit pops up to say hello. Let's hope he wins our Ocean Treasure slot jackpot so he can buy himself some more up to date diving apparatus. 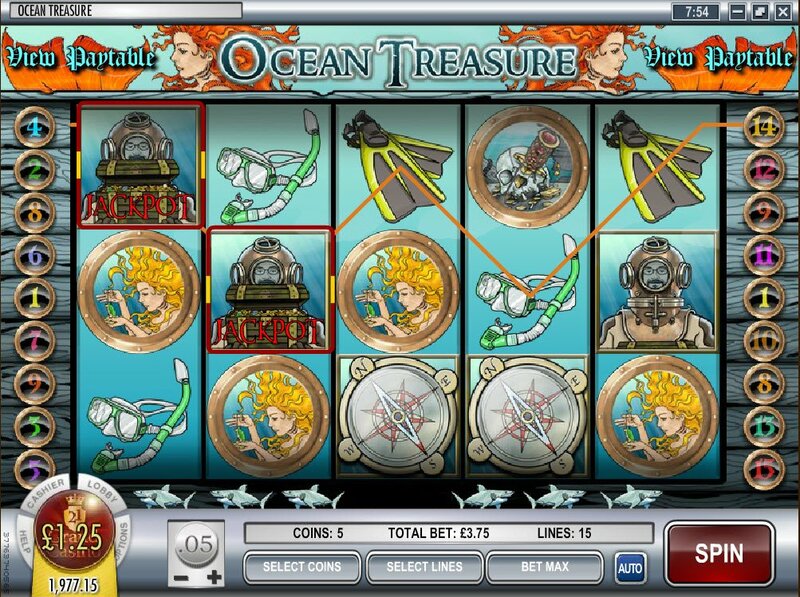 With calming music that could have come straight from the Little Mermaid, I kept looking out for our friend Ariel, to see if she would swim on by but, the dulcet and muted tones of this Rival Gaming slot just gave me the sound of bubbles as I spun the reels. Find a dollar in the sand, spin a complete scuba diver suit or just the goggles and flippers for anywhere between 80 to 175 coins to get you on your way, spinning around with the deep sea in hopes of an entirely new sort of buried treasure. 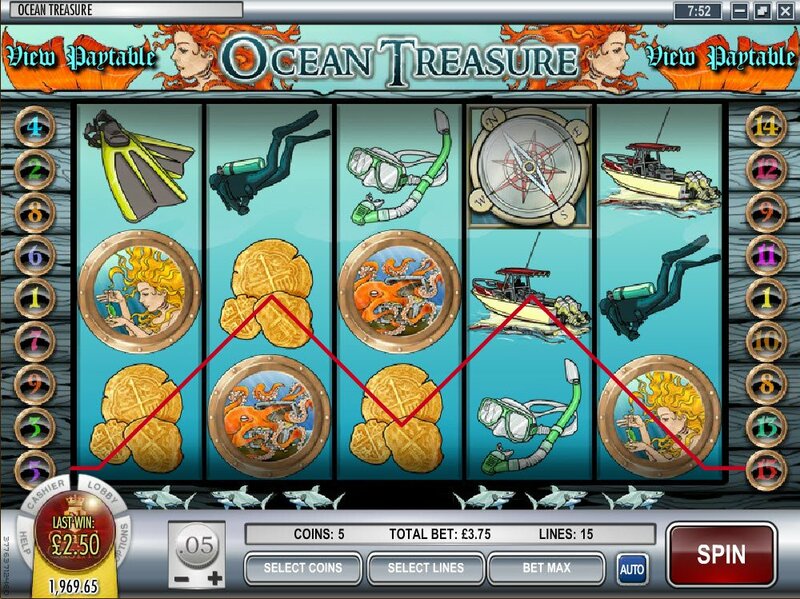 Let's hope he wins our Ocean Treasure slot jackpot so he can buy himself some more up to date diving apparatus. A blond underwater girl holding a jewelled pendant, who we only see the top part of is worth a cool 400 coins, perhaps she is a fabled mermaid? It looks like we are seeing her through the portals of a sunken ship and, the view offers us an orange octopus for up to 300 coins and a skull with a dagger embedded deep into it for up to 250 if spookily spun into all 5 reels. Our cute puffer fish; who is nothing like a puffer jacket, will drive you wild and can net you a cool 5000 coins if you are lucky enough to line up 5 of him on our 5 reel, 15 payline Ocean Treasure slot. Hit the jackpot with our intrepid diver for 1000 coins and be in the money to spin until you reach your heart's desire. 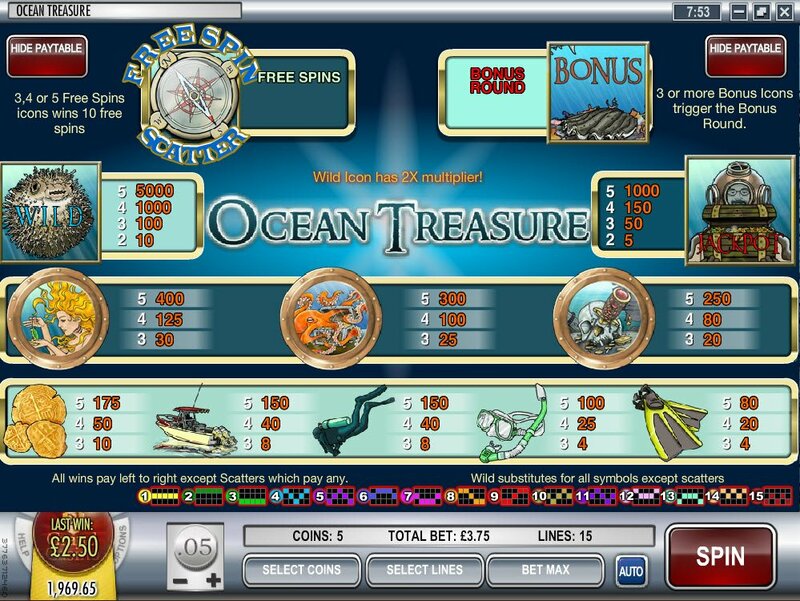 The compass will point you in the right direction of ten free spins and, find the clam bonus symbol to enter into the bonus round where you will chose the pearls of the ocean and hope you pick the one with the shiniest coins inside.